Did a US Drone Strike Take Out the ISIS AfPak Leader? Afghanistan’s envoy to Pakistan says that Hafiz Saeed Khan was killed in late July. Is that likely? Khan’s death has yet to be independently announced by the U.S. military. If true, the killing would mark the second significant U.S. drone strike against a high-value target in the Afghanistan-Pakistan region this summer. 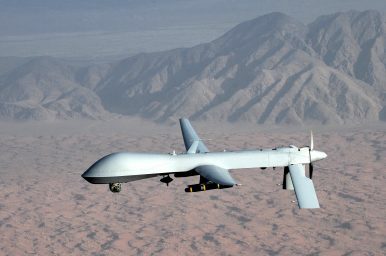 In May, the United States killed Mullah Akhtar Mansour, the erstwhile leader of the Afghan Taliban, in the country’s first drone strike inside the Pakistani province of Balochistan. “I can confirm that ISIS Khorasan leader Hafiz Saeed Khan along with his senior commanders and fighters died in a U.S. drone strike on July 26 in Kot district of Afghanistan’s Nangharhar province,” Omar Zakhilwal, the Afghan ambassador, told Reuters. Khan has been reported dead falsely several times. With these latest reports, there may be reason for skepticism yet, despite the Afghan ambassador’s confident testimony. After the strike against Mansour, for example, U.S. officials confirmed the kill promptly, with details of the circumstances of the strike emerging in press reports in the days after. If Khan was killed in a drone strike in late-July, the strike, like the one against Mansour, was likely carried out under the purview of U.S. Joint Special Operations Command. The United States splits its targeted killings between the Central Intelligence Agency and the Department of Defense. The former are so-called Title 50 covert actions under the United States Code, conferring a degree of plausible deniability. DoD-led strikes are usually publicized promptly. Given the highly visible global struggle against the Islamic State, it’s unusual that Washington wouldn’t already have confirmed and communicated Khan’s death. The Islamic State in Afghanistan has been intensifying its operations in recent months. Most recently, the group claimed responsibility for a devastating bombing in Kabul, the Afghan capital, that killed 80 people, mostly from the Shia minority Hazara community. ISKP’s operations take place on both sides of the porous Afghan-Pakistan border, but the group’s primary fighters are concentrated in Afghanistan’s Nangarhar province. The strike against Mansour was the result of carefully cultivated human and signals intelligence in Balochistan.